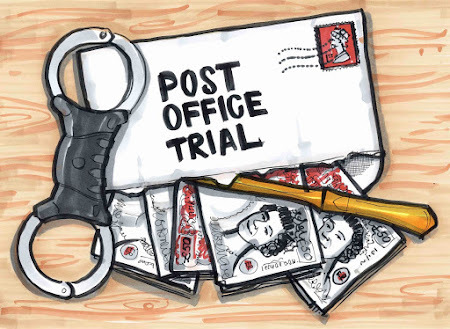 In 2015, the Criminal Cases Review Commission got interested in the number of Subpostmasters who had been given criminal convictions after being charged by the Post Office's own prosecutors on the basis of computer evidence. We know they are looking at the convictions of at least 30 people, two of whom (Seema Misra and Noel Thomas), feature in today's Daily Mail. "Apart from a small number of points of clarification, the investigation phase of the CCRC's review is now complete. We are now in a position to move into the decision making phase of the cases this autumn. This means that we will begin the phase of briefing the Commissioners who will ultimately decide whether any of the Post Office cases will be referred to the Court of Appeal." When I saw this, I remember thinking... "Eh?" The CCRC had been almost completely silent about this investigation for three and a half years. Now, just as the biggest civil trial in the country into exactly the same story was about to get underway, they were proposing to make decision in the middle of it as to whether or not the cases under review (most of whom were claimants in the trial) could be referred. Was it possible the CCRC weren't aware of the civil trial taking place at the High Court? Or did they just think that it didn't matter what happened in that trial, they were going to make a decision based on their own investigation? Either way - I had concerns. "The current position is that the Commissioners are being comprehensively briefed on the results of the CCRC's enquiries to date. The Commissioners are due to meet in December to discuss the case. A key point for the Commissioners to decide in the first instance, will be whether or not the CCRC must wait for the judgement(s) of the High Court in the Post Office Group Litigation, which is currently being heard, before any decisions can be issued in the CCRC cases which are under review.... we will let you know once it is decided whether or not we will wait for the High Court judgement(s) before issuing any CCRC decision. You can expect to hear from us on that point before the end of December 2018." I can't help thinking you would have to be insane not to take note of what is happening at the High Court right now. Any CCRC decision to the contrary risks a judicial review. Discussions about criminal activity have already taken place during the ongoing trial. If the judge presiding over this civil trial makes any sort of comment or ruling which even vaguely touches on criminal activity, it must have some sort of bearing on the CCRC's investigations. How could the CCRC's investigators make a definitive decision before a judge has made his? "Post Office's investigators seem to have found that obtaining admissions of false accounting was the key to achieving relatively rapid, and (to Post Office) inexpensive, asset recovery." On 21 November 2018 at the High Court, a Post Office security team leader called Helen Dickinson was asked by the JFSA's QC Patrick Green about the large numbers of Subpostmasters prosecuted by the Post Office leading up to 2013, and the strangely small number thereafter. In 2010 to 2011, there were 31 prosecutions. In 2011 to 2012 there were 38. In 2012 to 2013 there were 42. And then in the next four years, a total of three people. "QC: So far as you know, did that change in the number of prosecutions represent an internal recognition within Post Office that conduct which they had been treating as dishonest before was not in fact dishonest at all ? HD: No. We would only investigate matters as an investigating criminal offence if the postmaster had been suspended. So if they are put back in post I have no dealing with it, my team has no dealing with it. QC: So you have no knowledge of whether that represented an internal recognition that things that Post Office had previously regarded as actually dishonest they could then see were not in fact dishonest at all ? You don’t know, is that your evidence? HD: No, I wouldn’t say that, no. The suspensions are lower and then the cases that get referred to the investigation team are therefore lower. QC: Were the cases referred to the investigation team so that POCA [Proceeds of Crime Act] could be used to trace the assets? Sheesh. This is as close as the Post Office have got to admitting they prosecuted Subpostmasters on the basis of asset recovery rather than suspicion of criminal intent. If the CCRC won't take into account the rulings of a judge on this case - civil trial or not - they are going to have a hard time justifying why.